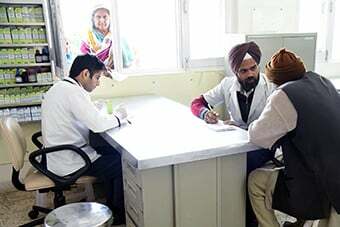 The three outpatient facilities (OPD) of the Maharaj Jagat Singh Medical Relief Society provide free medical services to sangat, sevadars and local residents in New Delhi and in Mumbai. Established in 1960, the OPD at Pusa Road Centre, functions from 8 am to 1 pm throughout the week, and round-the-clock when visitors from abroad are in residence, providing emergency, first aid and OPD services. Approximately 16,000 patients are treated annually. 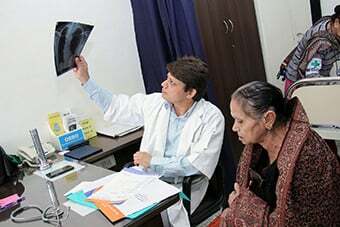 The OPD at Bhati Centre, which started as a first aid post in 1980s, has grown into a multispecialty outpatient facility. It provides free care in the disciplines of medicine, orthopedics, gynecology, ENT, ophthalmology, dentistry, dermatology, homeopathy, and pediatrics to sevadars, sangat and residents of the surrounding area. The multi-specialty OPD is equipped with life-saving equipment such as bi-phasic defibrillator, full resuscitation kits, multipara monitor, oxygen concentrator, and two crash-cart trolleys with all emergency drugs. The OPD operates from 9 am to 1 pm, but first aid services are available around the clock every day. The team of physicians, anesthesiologists, gynecologists, orthopedic surgeons, dermatologists, dentists, ophthalmologists, homeopathic doctors, registered nurses and paramedics at Bhati Centre, handles approximately 57,000 patients annually. In addition, the dispensary attends to 163,000 patients during three designated satsang programmes, bringing the total to over 200,000. Additional services include ECG, plasters, injections, contraception and IUD insertions and minor surgical interventions. 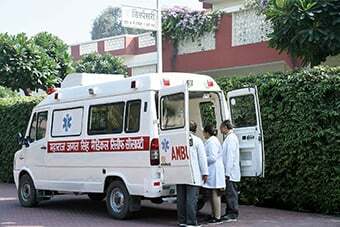 Bhati OPD also has a state-of-the-art ambulance available around the clock every day to take emergency cases to referral hospitals. With growing emphasis on maternal and child health, pulse polio drives have now become a regular feature along with antenatal care. An in-house pharmacy supplies all medicines free of charge to the patients, ensuring total quality control over the drugs administered to them. The dispensary sets up organ donation information counters every Sunday. The sangat is encouraged to sign up and their questions are answered. Approximately 5,000 people sign up annually and donation forms are periodically sent to the Organ Retrieval Banking Organization (ORBO). 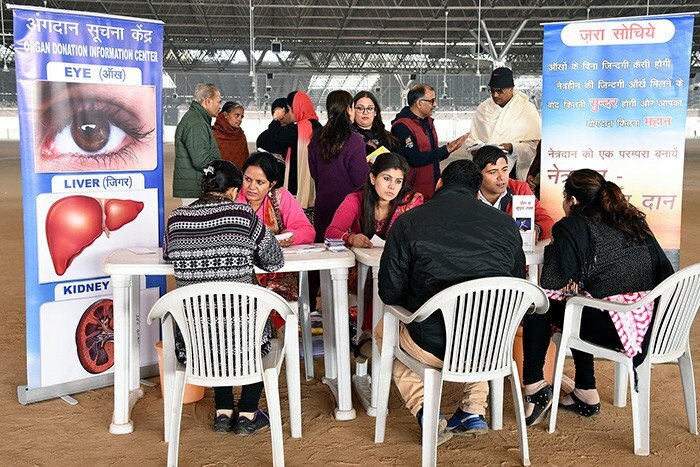 Medical check-up of new sevadars are also conducted at Pusa Road Centre and Bhati Centre. 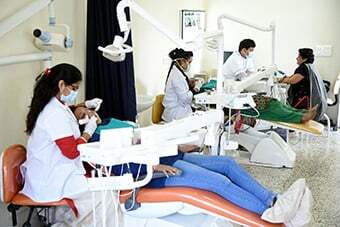 Seven dental surgeons and four attendants serve at the Dental OPD of the Bhati Centre, which has the latest equipment and instruments and two dental chairs. The surgeons are able to perform the advanced procedures such as single-sitting rotary (Wave 1) root canal treatment using the latest cordless endomotor, apex locator, guttacut, etc. Other procedures being conducted include extractions, fillings using light cure composite (laser filling), G.I.C/silver fillings, scaling and root planning, curettage and biopsies. Many people from neighbouring localities benefit from this free treatment. The dental clinic sees an average of 400 to 500 patients every month. During the Master’s regular visits however, the numbers swell and the clinic sees 500 to 550 patients over just four days. At this time, not just emergency treatment but also elective treatments are provided to sangat members who come from outside Delhi, particularly those who cannot afford costly treatments like single sitting (Wave 1) root canal treatment. 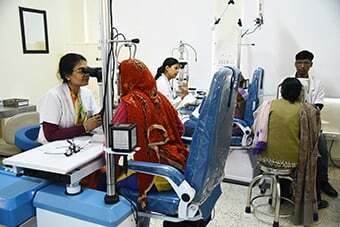 An Eye OPD was started at the Bhati Centre in March, 2016 and is equipped with the latest equipment including Topcon non-contact Tonometer for measuring intra-ocular pressure, Topcon auto-refractometer, slit lamp, direct and indirect ophthalmoscopes, Streak retinoscope, Schiotz Tonometer, lensometer, and gonioscope. Patients are screened for glaucoma, cataract and diabetic / hypertensive retinopathy. In addition, medical treatment is provided for allergic conjunctivitis, spring catarrh, bacterial / viral conjunctivitis, sty and dry eye. Since its inception, over 2,500 patients have been examined. Also, refractions have been done and glasses prescribed to over 1,200 patients. Numerous foreign body removals from cornea and conjunctiva have been performed and epilation of misdirected eye lashes has been done. In addition, corneal abrasions secondary to injury have been successfully treated. All of these services are provided free of cost. 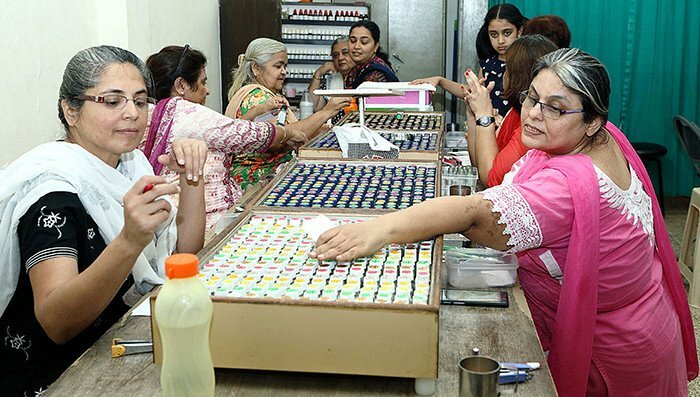 The homeopathic dispensary is located in the Sawan Sadan building at Bandra, Mumbai. It is run by six Homeopathic doctors, who are sevadars, along with 30 other support sevadars. The dispensary functions for about 2 to 2 ½ hours every Sunday and Thursday, after the conclusion of satsang. Average attendance on Sundays is between 200 to 250, while on Thursdays it is 150 to 200. Approximately 35-50 new patients are seen each day, while the rest are repeat patients.